Matt Lowton feels the Clarets have answered their critics after registering back-to-back wins on the road. Following victory against Rovers at Ewood Park two-and-a-half months ago Sean Dyche’s side went five games without a win away from Turf Moor. But their triumph in the FA Cup third round against Middlesbrough at the Riverside remedied a short bout of travel sickness and that result was reinforced by the 5-0 thumping of MK Dons in the Championship midweek. We have, definitely,” he said. “We’ve answered them. We have made a statement. Middlesbrough was a tough place to go, one of the toughest places to go in England, but we’ve won there and got through to the next round of the cup. Everything seems to be going to plan for Lowton at the minute. After being given the nod over Tendayi Darikwa, the 26-year-old has contributed to four clean sheets in five starts, claimed three assists and opened his account for the club when netting the fourth of five in Milton Keynes. 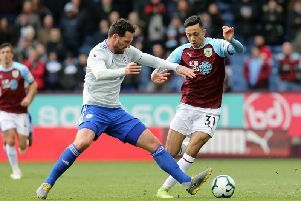 The defender, whose last goal came for Aston Villa in a 3-1 win over Stoke City at the Britannia Stadium in April 2013, said: “As a full-back it’s nice to get assists, I don’t usually get the chance to score but it was good to get my first goal for Burnley. It’s nice to get off the mark. And Lowton is determined to end the trilogy of away fixtures in similar fashion when the Clarets tackle Brentford at Griffin Park this evening (kick-off 7-45 p.m.). “We train hard for these sort of occasions,” he said. “We knew we had a lot of travelling to do but full credit to the lads, they looked after themselves, training is spot on. It’s credit to the whole squad, lads have come in and done well.